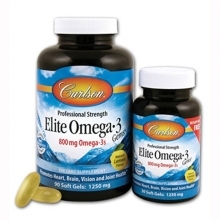 Carlson Elite Omega-3 Gems is a professional strength formulation that contains 1250 mg of fish oil per gel capsule. The premium fish oil in this formulation comes from deep, cold water fish that are especially rich in EPA and DHA. Just one Elite Omega-3 Gem capsule is all that the average adult needs to ensure optimal intake of these delicate, health-promoting omega-3 fatty acids each day. 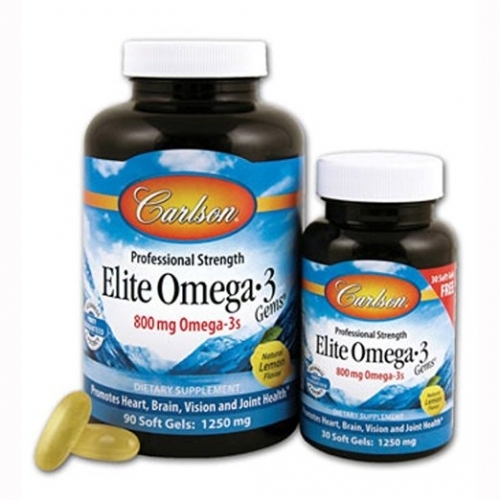 Carlson Elite Omega-3 Gems are regularly tested (using AOAC international protocols) for freshness, potency and purity by an independent, FDA-registered laboratory and have been determined to be fresh, fully potent, and free of detrimental levels of mercury, cadmium, lead, PCB's and 28 other contaminants. If you've been a long time subscriber to my natural health newsletter, you know how important two omega-3 fatty acids, DHA and EPA, are to your overall health, particularly to your cardiovascular and nervous systems. DHA and EPA are so critical to human health that I am convinced that high quality fish oil or cod liver oil should be a regular part of most people's diets. I have been taking cod liver oil on a daily basis for the past several years to ensure adequate intake of DHA and EPA, as well as to get some vitamin A and D from my diet. My wife took cod liver oil along with me year-round for the first few years, but in the summer of 2006, she began taking fish oil instead of cod liver oil. The major difference between cod liver oil and fish oil is that fish oil does not contain vitamins A and D.
My wife and I decided that since she gets a good amount of sunlight in the summer months, to ensure that she doesn't end up with too much vitamin D in her system from sunlight and food sources combined, she should use fish oil to nourish her body with DHA and EPA. And in the fall and winter, when she is unable to get vitamin D production from sunlight, she should use cod liver oil. I will be sticking with cod liver oil throughout the summer months because areas of my skin burn quite easily when I am out in the sun for long stretches at a time, so I usually stay indoors during the mid-afternoon. In looking through my patient files from January of 2002 to December of 2005, I found 82 patients whose blood levels of Vitamin D (25 hydroxy D) I had records for. Eighteen of these patients were from Ontario, and the rest were from all over the States. Forty-eight of these patients were taking cod liver oil on a regular basis. And none of them, even those from California and Florida, had toxic blood levels of Vitamin D.
During warm summer months, particularly if your skin get lots of sun exposure and/or you eat lots of fish that are naturally rich in vitamin D, such as salmon, mackerel, and sardines. During warm summer months if you are pregnant or nursing. Throughout the year if you live in an area where the weather is warm year-round and your skin is regularly exposed to sunlight. If a blood test shows that your vitamin D level (25 hydroxy D) is greater than 70 ng/mL (175 nmol/L). If you would like to switch from cod liver oil to fish oil during the warm summer months or even year-round, I recommend fish oil made by Carlson Labs.